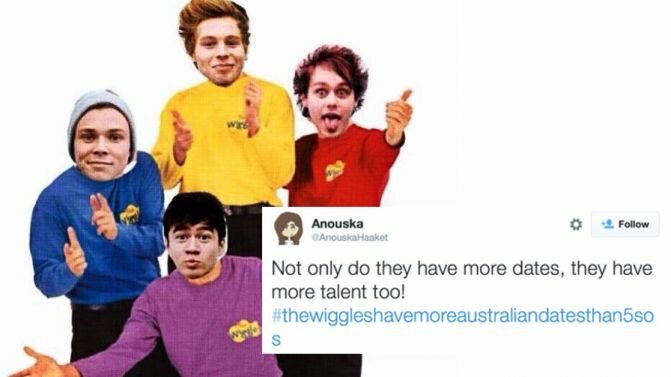 The Wiggles are feeling some serious love this morning, because their upcoming tour has more dates on it than the one 5 Seconds Of Summer announced during last night’s 2015 ARIA Awards. A very on-point hashtag came into the world shortly after 5SOS used a live video message at the ARIAs to announce the three-show (yep, three-show) Australian leg of their Sound Live Feels Live tour. The group made the announcement wearing animal onesies, but the news of only three local shows might have gone down better if they were wearing coloured skivvies. …and The Wiggles responded in the best way possible. Our current Aussie tour is going to Tassie/Perth/Adelaide/Melbourne/Canberra/Wollongong/Newcastle/Sydney/Brissy so the hashtag is true! 5SOS boys are set to perform in Melbourne, Brisbane and Sydney across September and October next year, while The Wiggles, as mentioned, currently have shows lined up all around the country. The group’s original (and best) lineup is even reuniting to perform an 18+ pub show in January, which is sure to be one of the hottest tickets of 2016. You can catch 5SOS’ upcoming Aussie tour dates below and get all up in some Wiggly goodness over at The Wiggles’ website, but remember, #thewiggleshavemoreaustraliandatesthan5sos. American Express Card Members pre-sale starts 11am Monday, November 30th until 5pm Tuesday, December 8th. To purchase go to: amexinvites.com.au. My Live Nation members pre-sale commences 10am Friday, December 4th. General public tickets on sale 9am Wednesday, December 9th.